Cop Out. Broken City, Reviewed. When Mark Wahlberg is at his best, it doesn't look as if he's acting. In fact, it hardly seems as if he's even thinking. Watch him in The Departed or I Heart Huckabees and he comes across as a flawed regular guy who just wants to do the right thing, even though his characters aren't always the brightest. He plays lugs you can't help but love. But that's when he's in a good movie. Put him in something as generic as Broken City and it's as if someone painted eyebrows on a sedimentary rock and threw it up on screen. His winsome commonness becomes a liability. He just stands there, inanimate. 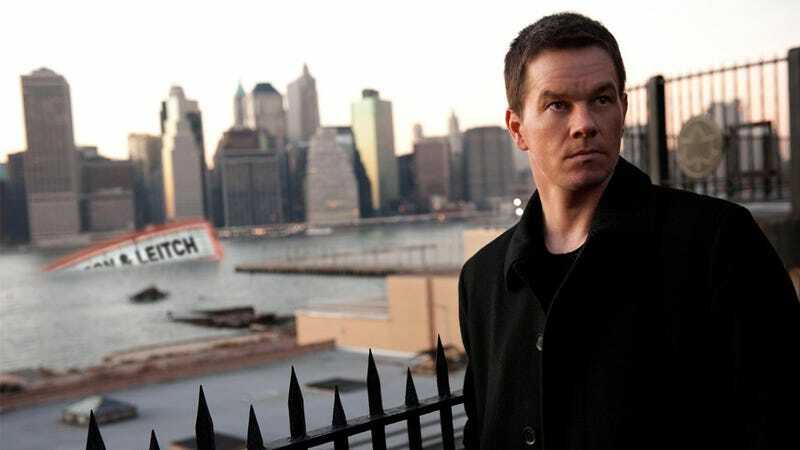 In Broken City, Wahlberg plays Billy, a former cop who left the force after he shot a suspect to death. (Billy claimed it was self-defense, and the courts agreed.) Now he's a low-rent private eye, taking pictures of wives cheating on their husbands, when his old buddy Mayor Hostetler (Russell Crowe) calls on him. The mayor is convinced that his wife Cathleen (Catherine Zeta-Jones) is screwing somebody else, so he hires Billy to find out fast: He's in a tough fight for reelection, and the voters go to the polls in a few days. Billy discovers that Cathleen is indeed sneaking around with another man, but, as you might imagine, everything is actually far more complicated and crooked than it first appears. This is one of those films that think it's big news that there's corruption in big-city politics. Unfortunately, director Allen Hughes (one-half of the Hughes brothers who long ago made Menace II Society) doesn't have much of a feel for his movie's New York City milieu. Just about every second that you watch Broken City, you're wondering what Spike Lee could have done with it. Granted, the script (by first-timer Brian Tucker) isn't all that interesting, but at least Lee would have provided the film with color, style, attitude, life. As it is now, the film is mostly tough New Yawkuhs swearing at each other when they're not double-crossing one another. Wahlberg does what he can playing The Cop Who Is Haunted By His Past (Version 10.7.5), and there is one intriguing wrinkle to the familiar formula: His girlfriend (Natalie Martinez) is the sister of the raped and murdered victim whose assailant Billy shot. (They started dating after the shooting, their relationship in part forged out of their shared pain.) But when you recall that Wahlberg parodied this exact type of disgraced character in The Other Guys—"You shot Derek Jeter! "—it's even more of a reminder of how by-the-numbers Broken City is. Even the movie's series of "unexpected" twists start to get numbingly predictable. A good rule of thumb while watching Broken City is to figure that if one character is assumed to be doing something, he or she actually isn't—instead, it's another character. (Broken City also thinks the audience will be blown away by the revelation that not everybody in the film is heterosexual.) Twisty thrillers aren't easy to pull off—they have to constantly keep the viewer confused without losing him in the process—but this one is just so stacked with red herrings and obvious "surprises" that I frankly stopped caring and began daydreaming about what an Inside Man 2 might have looked like. As for Crowe, while watching him I thought about how in some ways his appeal isn't that much different than Wahlberg's, albeit pitched at a higher level. At his best, Crowe projects a rugged masculinity that feels honorable and heroic and modest at the same time. From the get-go in Broken City, we know that Hostetler can't be trusted, and maybe Crowe signed up because it gave him a chance not to play the good guy for once. (One of his best roles is still Ben Wade in 3:10 to Yuma.) But like with Wahlberg, Crowe seems to disappear inside his macho shell for Broken City, becoming a hulking man from which no emotion or feeling can emanate. It's bad enough that Broken City isn't very good, but what makes it really depressing is how dull its performances are. Big-city corruption is a fact of life, unfortunately, but so is uninspired filmmaking.